Nominated for the 2014 RONÉ “Best Indie or Small Published book of 2013 Award”. A Cornish Victorian romance set against the backdrop of the magnificent Bosvenna Estate, with eccentric rural characters and the sweeping hills of the dramatic Bodmin Moor. Janey Carhart’s story is a tale of obsession, jealousy and love. At the age of nine, Janey’s younger sisters die from scarlet fever and her grief stricken mother blames Janey for their deaths. Financial difficulties and a desire to win back her mother’s love, forces Janey to enter service where she quickly rises through the ranks. Upon her arrival to the elegant Cornish Country Estate, she successfully secures a position of a lady’s maid for the wealthy and powerful Brockenshaw family. An exchange of letters between Lady Brockenshaw and her son ignites Janey’s interest, but Janey’s feelings for this mysterious and charming gentleman soon change her life forever. 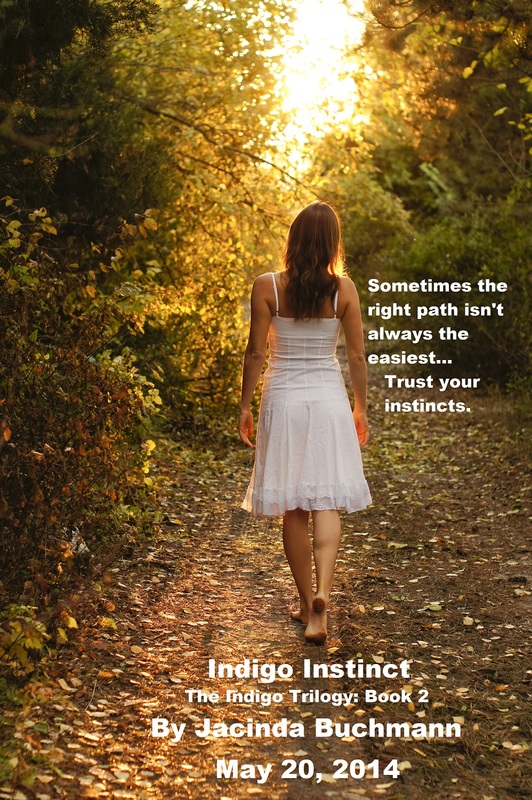 Old sins cast long shadows and not only does Janey’s mother’s wrath affect Janey’s life, there are others whose sins risk destroying her, the people she cares about and her capacity to love again. Daniel Kellow, her neighbour, offers his help. Can she trust this man who has, it is rumoured, killed a man? Who is the real Daniel Kellow and can she trust him? Can he trust her? This has been my of my favorite books of the year so far! Don’t let the cover fool you. Even though it is beautiful, I don’t think it portrays the emotional depth and romantic roller coaster that is experienced by the main character, Janey. 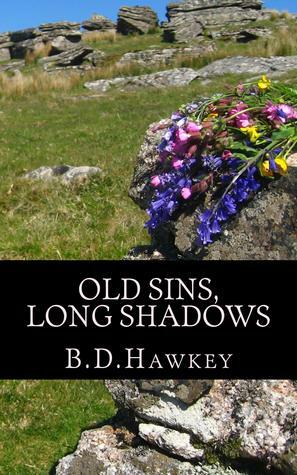 Told from multiple points of view, OLD SINS, LONG SHADOWS is mostly told from the viewpoint of Janey who is hired as a lady’s maid. She struggles to find her way amongst the rest of the staff and soon fights her attraction to two very different men – one who is above her class and the other who is abrupt, mysterious, and aloof. As the story progresses through rich English language and imagery of the Cornish countryside, made more realistic by an author who is from the country, Janey is confronted with one emotional struggle after another. It was a tale of love, turmoil, and emotional struggle, and without giving the story away, I adored the ending even though I didn’t want the story to end, and highly recommend this story to anyone who enjoys a rich, romantic historical saga. This was a story whose characters stayed with me long after I finished the book. The batter itself was easy because I used a simple box cake mix. I’m usually all about making everything from scratch – which is what I did for the frosting – but for this recipe, a box cake mix was just fine. To make a four-layer cake, as seen in the picture, I used two boxes. The rainbow swirl part is easy. As you can see in the pictures below, I measured out equal parts of cake batter into separate bowls then added food coloring to each. 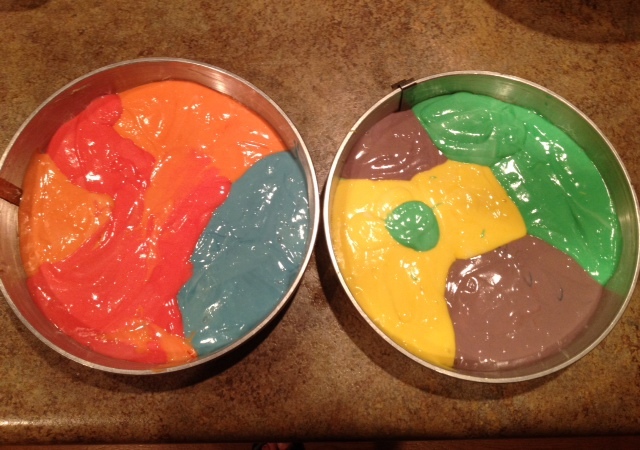 After that it was a simple matter of dropping various colors into the cake pans. Combine the pudding with milk and flavoring. Mix until smooth. Gently fold in Cool Whip. Once the frosting is made it’s a simple matter of laying down each layer of cake and spreading the Cool Whip mixture on top of each layer. 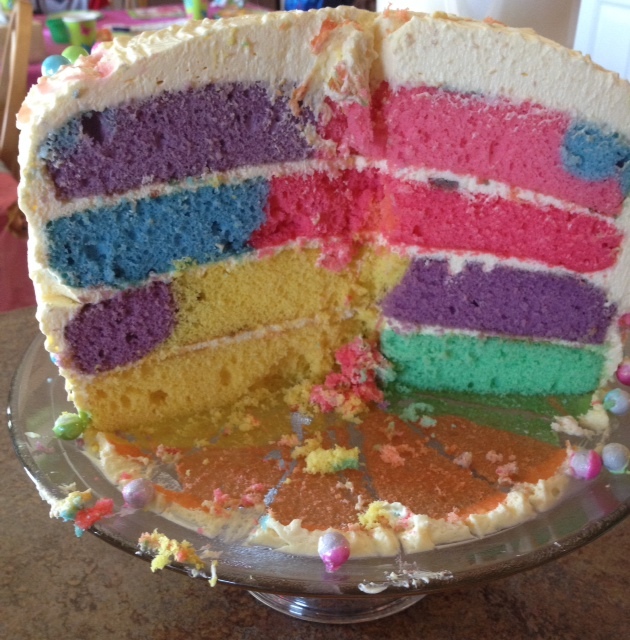 Once all of the layers are stacked, spread the remainder of the frosting to completely cover it. There was no way I was going to get the frosting perfectly smooth, so instead I used a fork and swirled it through the entire cake to give it texture. 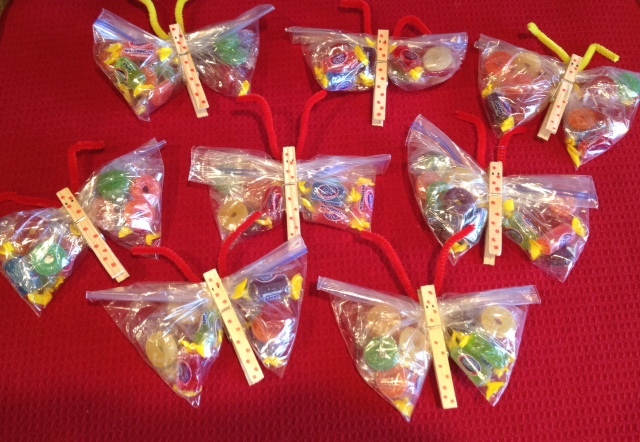 After that, it was a simple matter of pressing in the small candies around the cake. I was afraid the candies would be hard, but they were chocolately and soft on the inside (found in the cake department at Walmart). 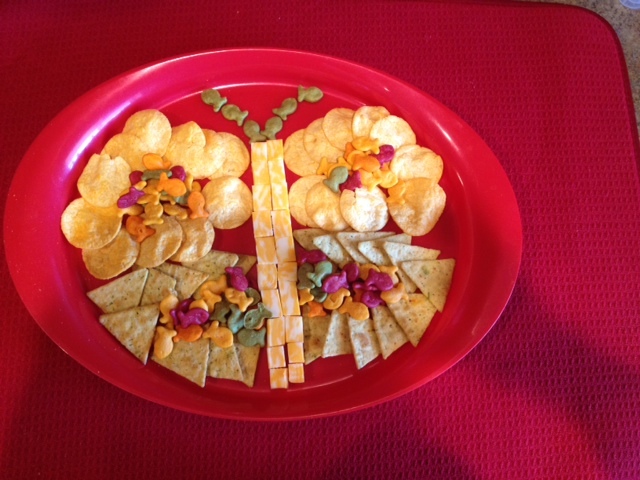 The butterflies on top were lollipops ordered from Oriental trading company. Super easy to stick into the cake. The only mistake I made (and I should have known better), don’t put the candies in until you’re almost ready to serve it. I made the cake the night before and decorated it, and by the next morning, a lot of the coloring from the candies had dripped into the white frosting. 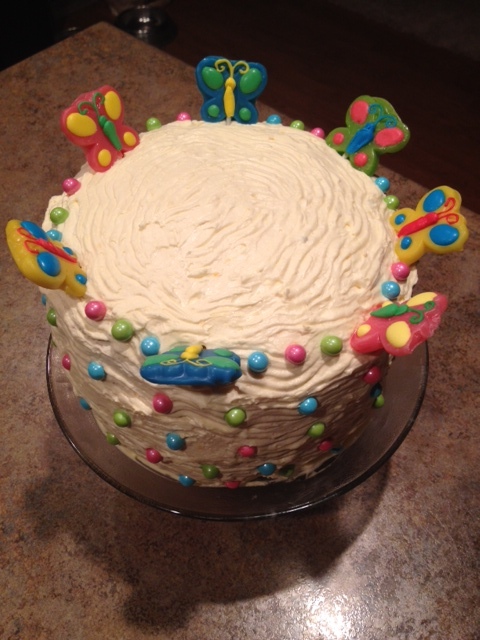 It was still cute, but if you want a cake that looks as perfect as possible, I would wait to decorate it. I enjoyed the story a lot. It was a quick read and kept me wanting to find out what would happen next. As with any story there are always aspects that I enjoy and things I would change. The story is told from a first person point of view from the main character, Evan. At age seventeen, Evan is orphaned at the beginning of the story and sent to live with a relative she’s never met. Her world is surrounded in mystery from the moment she enters her new life, and she is kept relatively in the dark throughout most of the story. Crystal has a knack for keeping the story progressing smoothly, and I flew through the book because I kept wanting to find out what would happen next. Soon after Evan arrives to her new town, she begins to discover that she is developing supernatural abilities and can manipulate the elements of nature. As much as I enjoyed the story, I had mixed emotions about the main character Evan and had a hard time relating to her. When I read YA books, I always consider the teenagers I work with and whether I would recommend the same book for them. 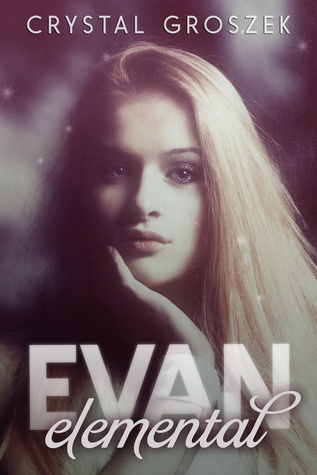 Keeping in mind that YA books are typically considered to fall in the 13-17 age group, I would definitely say that this story is for the older age range of mature YA readers due to language and Evan’s poor choices of turning to drugs. The story would have been just as entertaining if Evan didn’t use drugs because there wasn’t an explicit “good” reason following the plot development for her to turn to drugs, not that there ever is a good reason anyway. In this case, Evan just seems like a spoiled brat. I can see that teenagers who struggle with drugs and alcohol would be able to relate to the character, but the main plot of the story has nothing to do with overcoming a drug addiction, it was just a character flaw. I would have enjoyed it more if Evan could be seen as a better role model to younger readers. With that said, because I had to get in out there since this is a YA book, it was an enjoyable story. I had a hard time deciding which Father’s Day project to do this year. 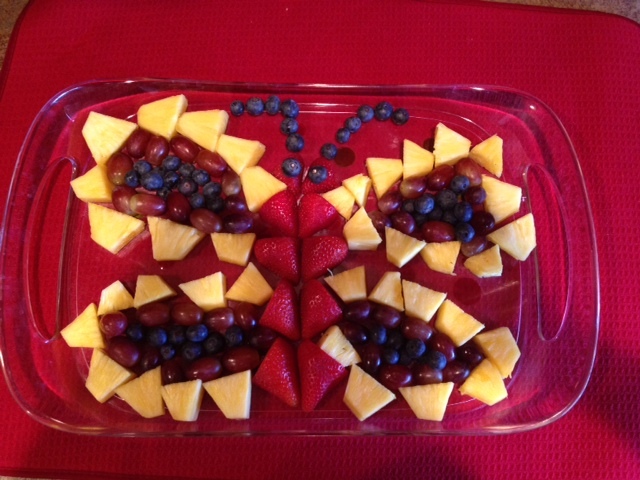 After perusing Pinterest, I came up with a ton of fun ideas. 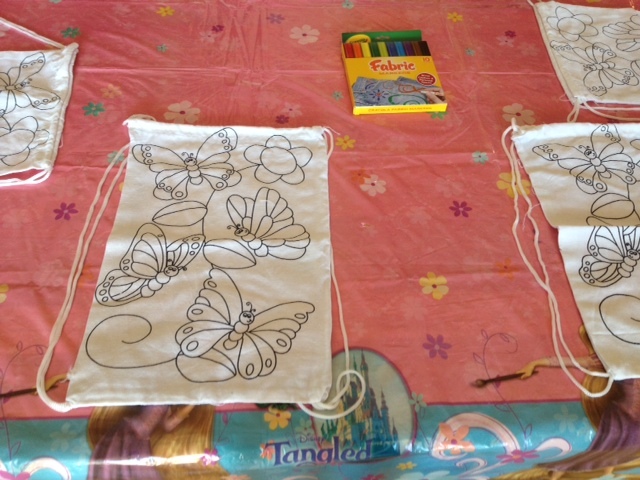 I pinned all of the great projects I found under “Kids Crafts” if you’re looking for other Father’s Day ideas. 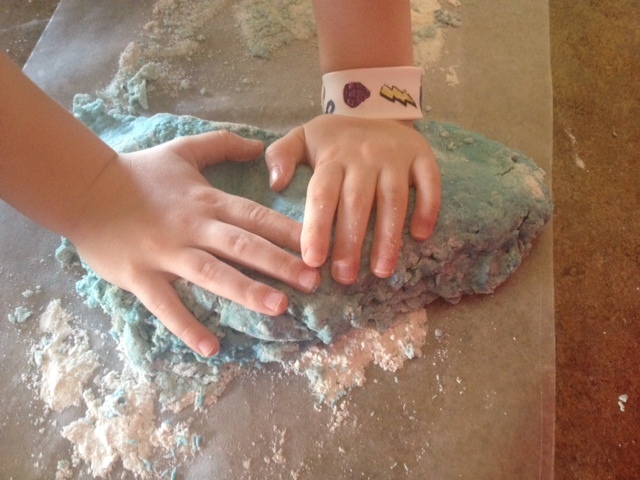 The link to my Pinterest page is at the bottom of this post 🙂 I decided on this salt dough project because my kids LOVE rocks and they were all able to participate in the project. To start with I sent the kids into the backyard in search of rocks. This was the easy part because I live in Arizona, and half of my backyard is made up of rocks 🙂 The project definitely could have been on a smaller scale using smaller rocks – the rocks we used ranged between 1/2 inch – 1.5 inches. The dimensions for the final project are 12″ x 6″. It’s optional of course, but I decided it would look cute and be more personalized if they made an imprint of their hands first. 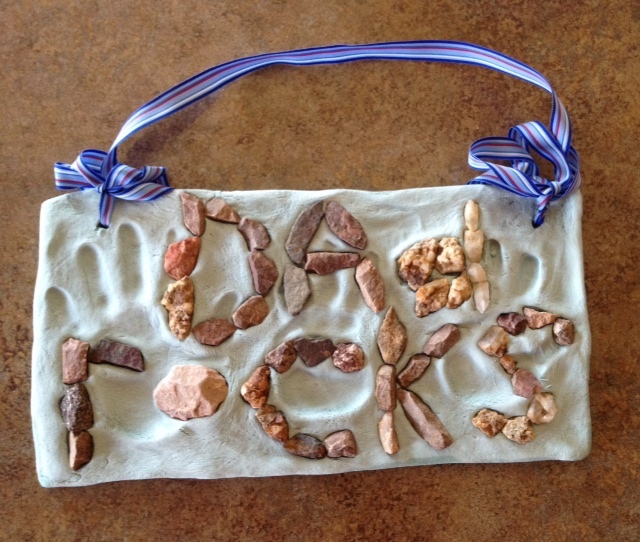 The rocks cover up half of their handprints, but I like that it gives a personalized touch 🙂 Once they pressed their hands in, I carefully pressed in each rock. I thought each rock was secure, but once it had baked, 2 of the rocks fell out. This is an easy fix with superglue, but I would suggest double checking that the rocks are completely pressed into the dough. Another thing to be aware of is that if you make a project of this size it’s going to take a REALLY long time to bake, so don’t plan on using the oven for a while. Also, if you plan to hang it up, which I hadn’t planned on at first, make sure you punch the holes before you bake it. After we put it all together, I started to bake it and then started wondering what we were going to do with it once we give it to “Daddy” for Father’s Day. It’s a little too big to just place on a desk. About an hour and a half into the baking process, I realized that it would look cute hung up, so I pulled it out of the oven, and thankfully the dough was still soft enough that I could punch holes 🙂 A small smaller project, of course, would make a cute paper weight. Mix flour and salt in a bowl. 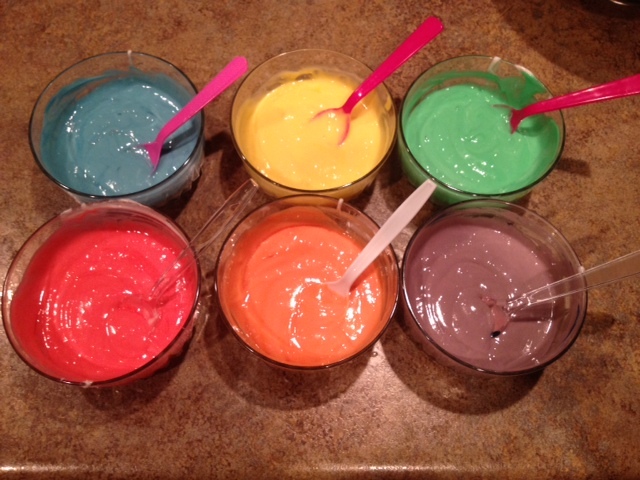 To make colored dough, add a couple teaspoons of food coloring to the water before you add it to the flour mix. Slowly stir in the water then knead the dough on a floured surface. 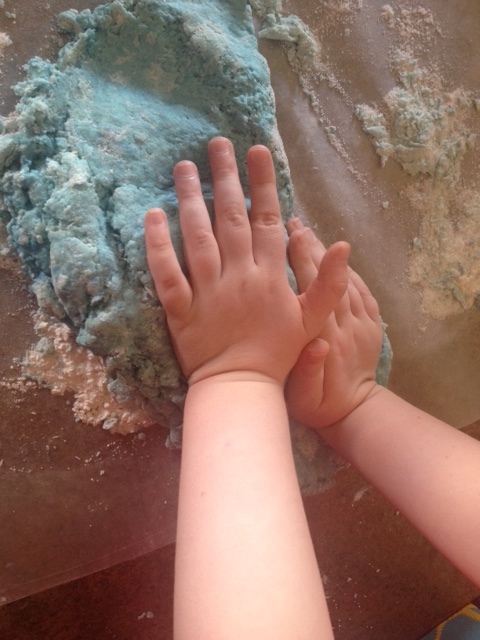 If the dough is too crumbly, slowly add a little water at a time until it is smooth and elastic – 5 to 10 minutes. Bake at 170 degrees on a baking paper lined tray. It will take a while so just keep an eye on it. The bigger the project, the longer it’s going to take. The project is finished when it’s hard and you can’t make an indentation in it. Also be sure to check the bottom. At first I thought our project was finished, but the bottom was still soft. I peeled the paper off and put it on a lower rack to finish baking. 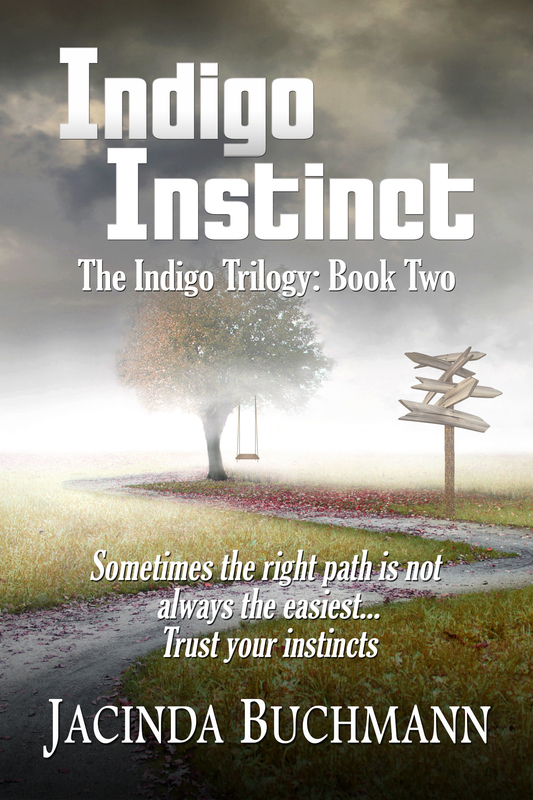 In case you missed it, I wanted to share the trailer for Indigo Incite. Make sure to enter the Rafflecopter giveaway, too, for a chance to win a $10 Amazon giftcard and four fantastic eBooks! 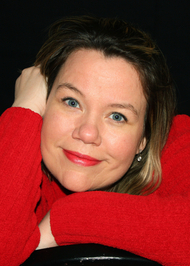 I am thrilled to present my final interview of the year with author Cyndi Tefft. 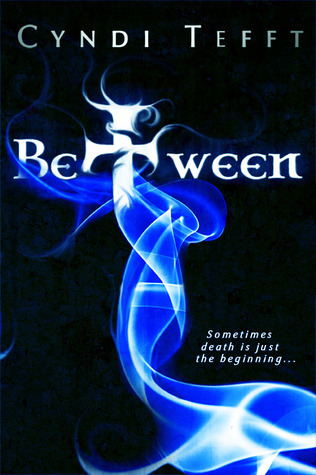 I haven’t yet read her book, BETWEEN, a YA paranormal romance, but I have just added it to my TBR list and absolutely can’t wait to start reading the series. As I’ve gotten to know Cyndi I have discovered that she and I have a lot in common so I know that I will love her writing. The plot sounds fascinating so I’m excited that it’s a series so I’ll be able to continue the story line once I finish the first book. Please enjoy her interview and then check out the blurb for the first book in her series, BETWEEN. 1. Cyndi, I just looked up the first book in your series, BETWEEN, and I’ve just added it to my TBR list! You had me at Scottish accent 🙂 Add in paranormal romance and I’m hooked. I can’t wait to read it! What makes BETWEEN stand out from other paranormal romances? 2. When I write, I am often surprised my things my characters do and say. What has surprised you the most about your characters? Lindsey, falling for Aiden is anything but practical. What do you see in him that you find irresistible? 4. I was thrilled to learn that you’re from Seattle because that’s where I grew up. When you’re not writing, what do you do for fun in Seattle? Seattle is a great city (apart from the miserable traffic!). I’ve lived here for about six years. There are a ton of touristy activities to do here (Space Needle, Seattle Center with the Pacific Science Center and the Chihuly Glass Museum, the Experience Music Project and the Science Fiction Museum). I’m a little bit of a homebody, though, so I tend to go out with friends for food and fun, just like you’d do anywhere else. 5. I also see that you’re just as crazy about Scotland as I am, and I am extremely jealous that you’ve been there. What did you enjoy the most about your visit? I’ve been twice, actually, and I would go again in a heartbeat if I could! The highlight of the first trip was visiting Eilean Donan Castle (the home of the hero in my books). Standing in the great hall that I’d written about, seeing it through Aiden’s eyes, was a surreal experience! On the second trip, we visited Orkney (islands to the north of the mainland), where there are ancient stone villages sunk into the earth. Totally cool! 6. If BETWEEN was turned into a movie, who do you imagine would play Lindsey and Aiden? I actually have a Pinterest board where I collect pictures just for this fantasy! http://www.pinterest.com/cynditefft/between-series/ Chris Hemsworth is the closest I can come to Aiden. There are a few women who have the look of Lindsey, but the closest is a model Rachel LaHood. I can’t imagine what it would be like to see the book come to life on the big screen. Amazing. As my daughter would say: DO WANT. 7. What are your favorite must-have comforts when you are writing? I listen to classical music while writing, which helps me block out the rest of the world and slip into the zone. Mostly, I just need space where no one is going to interrupt me! 8. What sort of writing projects do you have planned for the future? I am currently writing the fourth book in the Between series, as well as dabbling here and there on some other projects, both YA and adult. Anything I write will be a love story, though! Want to read Between and the rest of the series?